In the middle of the forests, there was a nice little fir tree. The place where the fir tree is has lots of fresh air and sunshine. Near the little fir tree are many tall and grown up fir trees. The little fir tree wish she could grow up fast and be like the tall fir trees that stood near her. The little fir tree did not appreciate the warm sunshine, and fresh air around her. Everyday, many children will ran about the little fir tree while picking strawberries in the woods. The fir tree like the children to praised him but he couldn’t stand when they called him little. The fir tree wishes she should grow up fast. The fir tree felt very miserable. Not even the sunshine, birds, and red clouds that passed by her makes her happy. During the winter, a hare would always come and hop over the little fir tree. This annoyed the fir tree very much and she hope to grow up faster all the more. After a few years, the little fir tree had grown up to be a tall fir tree. In the autumn, the wood cutters always come to fell down some of the tall trees. When the fir tree saw this, she was scared and wonders where they all go. When Christmas are coming, many young fir trees were being cut down. Some of them are not even as old as the fir tree. The fir tree grew taller and taller. When it was near Christmas, a woodcutter cut down the fir tree. The fir tree dropped onto the ground with a loud sound. The fir tree did not feel happy at all because she is being separated from her home. The fir tree kept on grumbling until she was being unloaded from the cart. Then two servants came and carried the fir tree into a large and beautiful drawing room. They put the fir tree upright in the sand and then decorated it all kinds of ornaments like dolls, toys, gilded apples and walnuts, and blue and white tapers. Finally they fixed a large gold star at the top of the fir tree. The fir tree looks splendid and beautiful beyond description. Now, all the candles on the fir tree are lighted up. Suddenly, the folding doors open and the little children rushed to the fir tree and the fir tree nearly falls down had it not been firmly fixed. There are a few elders that lead the little children that came in. “Fire! The Christmas tree is on fire!” Someone quickly came over to extinguish the fire. The children dance around the little tree and sing Christmas songs. The candle lights on the fir tree fell down and keep burning the tree until the very branches. 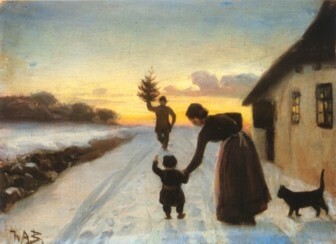 When the fires are put off again, the children were given permission to plunder the fir tree. They all rush together against the tree so violently that all the branches of the tree were broken. Some of the children shouted Ivedy Avedy; but someone of the children shouted Humpy Dumpy. The short and fat man tells them how Humpy Dumpy fell downstairs and marries the princess in the end. The children say to the short and fat man, “Tell us the story of Ivedy Avedy too.” But the short and fat man only tells them the story of Humpy Dumpy. The next morning, the servant came and dragged the fir tree into the attic upstairs. The servant put the fir tree in a very dark corner where the sun cannot shines in. Two mice came out of their holes at the attic and came to the fir tree. They rustled among the branches. The fir tree answered, “I have never been to the most beautiful place in the world. But I know a place where the sun shines very brightly and the little birds chirp so joyfully.” The fir tree told the two mice about his childhood and they listened to her. The next night, the mice came with another five mice and they all gathered to the fir tree. Then the fir tree tells them the story of how Humpy Dumpy fell down from the stairs and marries the princess in the end. The mice says, “Then Goodbye.” All five mice left the fir trees and went back to their holes in the attic. One morning, some men came into the attic and carried it downstairs into the garden. When the children saw the fir tree, they are so happy and they sing and dance around it joyfully. The fir tree saw the beautiful flowers in the garden and breathed the fresh air. Then the fir tree thought about the Christmas eve night when she was so magnificently decorated. The fir tree says, “Everything has passed. It is all over.” The gardener boy chopped the tree into wood blocks and then uses them to make fire. The fir tree sighed every time each branches is being chopped. The children continue to play in the garden and the youngest one wore the golden star in his breast. That is the end of the story.